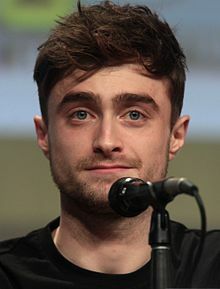 ↑ 1.0 1.1 "Daniel Radcliffe". Internet Broadway Database. สืบค้นเมื่อ 16 June 2014. ↑ "THE 7th CRITICS' CHOICE MOVIE AWARDS WINNERS AND NOMINEES". Broadcast Film Critics Association. สืบค้นเมื่อ 31 May 2011. ↑ Mancini, Robert (23 April 2002). "'Lord of the Rings,' 'Fast and the Furious' Top MTV Movie Award Nominees". MTV. สืบค้นเมื่อ 31 May 2011. ↑ Carroll, Larry (24 April 2006). "Alba, Carell, 'Crashers,' 'Virgin' Big Nominees For MTV Movie Awards". สืบค้นเมื่อ 30 May 2011. ↑ "The Empire Award Nominations Are In". Empire. Bauer Media Group. 4 February 2008. สืบค้นเมื่อ 30 May 2011. ↑ Adler, Shawn (6 May 2008). "MTV Movie Award Nominations Show Some McLovin To 'Superbad,' 'Juno,' 'Transformers' And More". MTV. สืบค้นเมื่อ 30 May 2011. ↑ Weinberg, Scott (20 February 2008). "2007 Saturn Award Nominees Have Landed". Moviefone. AOL Inc. สืบค้นเมื่อ 30 May 2011. ↑ Broadway.com Staff (22 May 2011). "The Fans Have Spoken! 2009 Broadway.com Audience Award Winners Announced". Broadway.com. สืบค้นเมื่อ 30 May 2011. ↑ Broadway.com Staff (21 April 2011). "2009 Drama League Award Nominees Announced". Broadway.com. สืบค้นเมื่อ 30 May 2011. ↑ "Vote for J-14's Teen Icon Awards!". J-14 magazine. Bauer Teen Network. 14 September 2010. สืบค้นเมื่อ 30 May 2011. ↑ Broadway.com Staff (15 May 2011). "2011 Broadway.com Audience Choice Award Winners Announced". Broadway.com. สืบค้นเมื่อ 30 May 2011. ↑ "2011 Outer Critics Circle Nominations Announced! SISTER ACT LEADS WITH 9!". BroadwayWorld.com. 26 April 2011. สืบค้นเมื่อ 21 September 2011. ↑ Gans, Andrew (20 May 2011). "Mormon, War Horse, Normal Heart, Anything Goes, Mark Rylance Win Drama League Awards". Playbill. Playbill, Inc. สืบค้นเมื่อ 21 September 2011. ↑ "56th ANNUAL DRAMA DESK AWARDS ANNOUNCED AT NY FRIARS CLUB BY AUDRA McDONALD AND LIEV SCHREIBER". Drama Desk. สืบค้นเมื่อ 31 May 2011. ↑ "Movie Star Nominees". VH1. 2011. สืบค้นเมื่อ 12 September 2011. ↑ MTV Movie Award Staff (3 May 2011). "'Eclipse,' 'Inception' Lead 2011 MTV Movie Awards Nominations". MTV. สืบค้นเมื่อ 30 May 2011. ↑ "Best Fantasy Actor". Spike TV. สืบค้นเมื่อ 12 September 2011. ↑ "Best Ensemble". Spike TV. สืบค้นเมื่อ 12 September 2011. ↑ Votta, Rae (29 June 2011). "Teen Choice Awards 2011 Nominees Announced: Harry Potter vs Twilight". Huffington Post. HuffingtonPost.com Inc. สืบค้นเมื่อ 16 August 2011. ↑ "Nominations Announced for the 'People's Choice Awards 2012'". TVbythenumbers. Zap2it.com. 8 November 2011. สืบค้นเมื่อ 1 January 2012. ↑ "Best Musical Theater Album". National Academy of Recording Arts and Sciences. 2 December 2011. สืบค้นเมื่อ 2 December 2011. ↑ "MTV Movie Awards: Check out the winners here". Entertainment Weekly. 3 June 2012. สืบค้นเมื่อ 3 June 2012. ↑ "Empire Hero Award Daniel Radcliffe". Jameson Empire Awards 2013. สืบค้นเมื่อ 12 October 2013. หน้านี้แก้ไขล่าสุดเมื่อวันที่ 23 ตุลาคม 2561 เวลา 19:07 น.